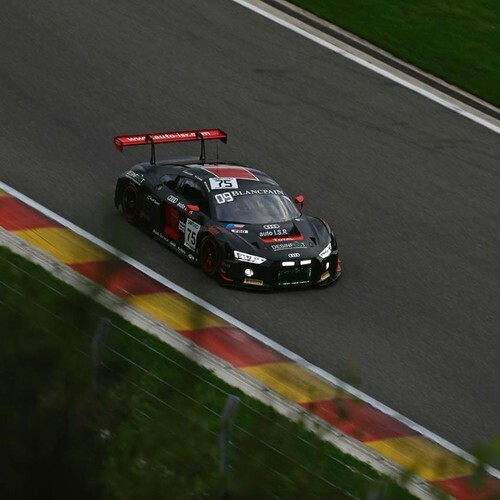 "No próximo fim de semana participarei nas 24h de SPA com a Barwell Motorsport e o Lamborghini Huracan. 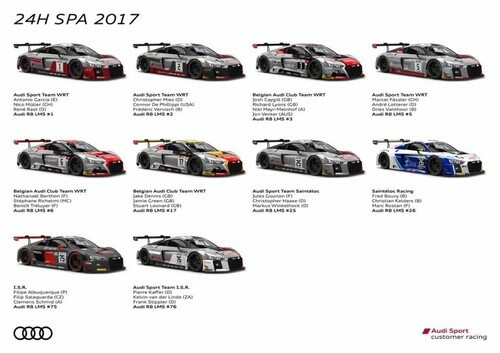 Esta que é a prova Rainha do melhor plantel de GT’s do Mundo, terá à partida 64 dos mais competitivos exemplares desta categoria e 220 pilotos. (SRO / Dirk Bogaerts Photography)"
"O que acham do meu carro para este fim de semana? What do you think of my car for this weekend?" "Boa qualificação, 14. Calma, hoje o objectivo era ficar no Top20 :) Amanha ha a última qualificação. 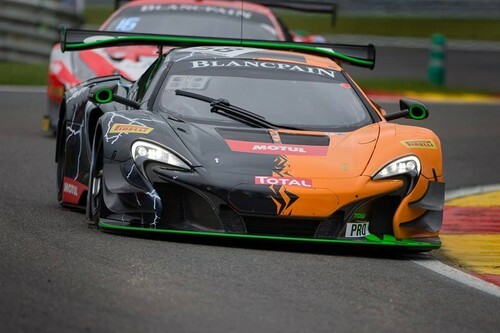 Note: 20 driver in 0.4s @ Circuit de Spa-Francorchamps"
McLaren GT customer teams Strakka Racing and Garage 59 have qualified their 650S GT3s for this weekend’s Total 24 Hours of Spa, following today’s pair of Qualifying sessions on the Spa-Francorchamps circuit. 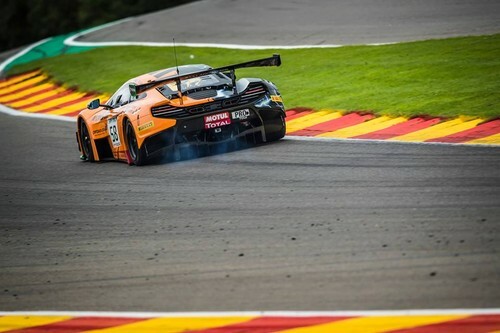 The highest placed McLaren 650S GT3 after the Qualifying and Night Qualifying sessions was the #59 from Strakka Racing shared by McLaren GT Academy Drivers Andrew Watson and Jazeman Jaafar and Pieter Schothorst. The best time in the car was set by Watson in the first session, a 2:19.210 to put the team P24 overall on the grid. 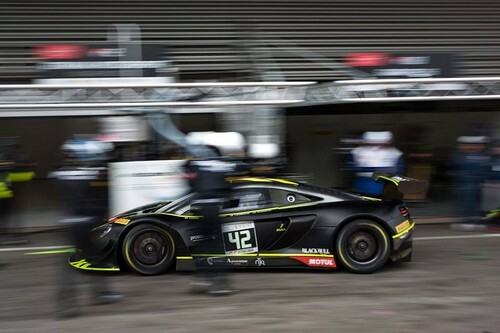 Right behind, in P25, was the second of Strakka’s 650S GT3s – the Pro-Am-entered #42 of Lewis Williamson, team founder Nick Leventis, Oliver Webb and Craig Fleming. The fastest time from the quartet came from Williamson, the Scotsman lapping the circuit in 2:19.219 during Night Qualifying to put the car P25 overall for the race and an impressive P3 in Pro-Am. 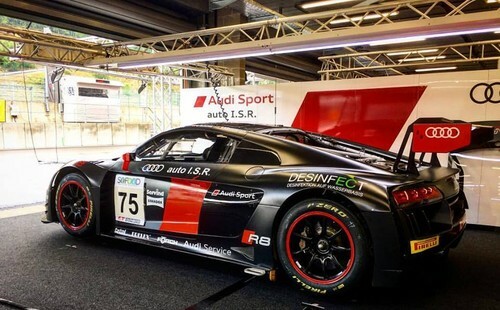 The British team’s other two cars, ended up P33 (#58 – 2:19.435) and P53 (#43 – 2:20.445). Garage 59’s sole car in the race meanwhile, will start the race P5 in Am and P59 overall. Piloted by Top Gear Presenter Chris Harris, McLaren Automotive Test Driver Chris Goodwin, GT Open regular Alexander West and former British GT champion Bradley Ellis, the car's best time was a 2:22.671. Both qualifying sessions proved to be extremely tight. The top 36 cars finished within a second of one another after the three hours and 15 minutes of track time. The two sessions decided the starting positions from P21 down, and the selection for tomorrow’s Top 20 Super Pole session. So, while all five McLarens were unable to advance to Friday’s Top 20 shootout, the Strakka Racing and Garage 59 McLarens will nevertheless be in the mix during the weekend’s gruelling and unpredictable twice-around-the-clock classic. 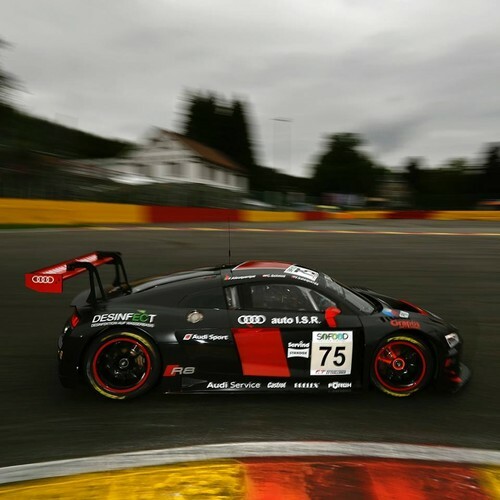 Saturday’s Total 24 Hours of Spa is set to run from 16:30 local time in Belgium (UTC+1). 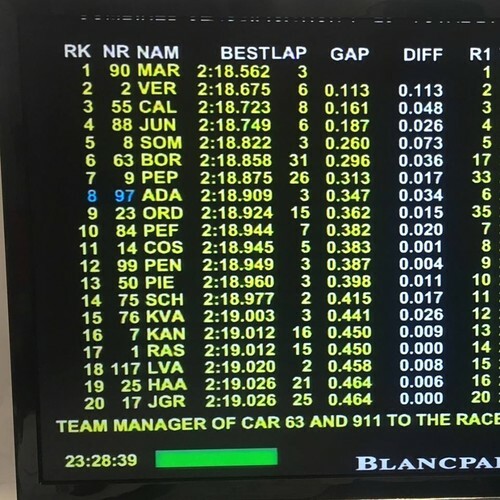 You can follow the race live for free at on the Blancpain GT website (http://www.blancpain-gt-series.com/live) and monitor McLaren’s progress throughout via the McLaren GT Pitwall (http://cars.mclaren.press/gt-pitwall). 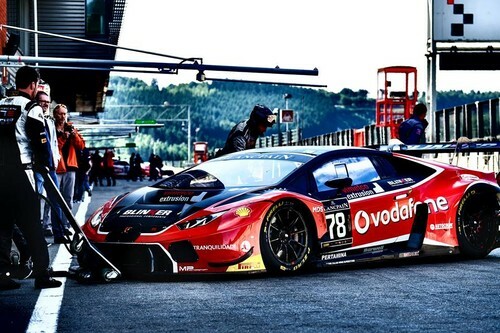 On social media, in addition to the periodic reports here on Facebook, @McLaren_GT on Twitter and @mclaren_gt on Instagram will also be active throughout the race. P59 (P5 Am class) #188 – B. Ellis, C. Goodwin, C. Harris, A. West"
The race will start at 16h30. Let's do this "